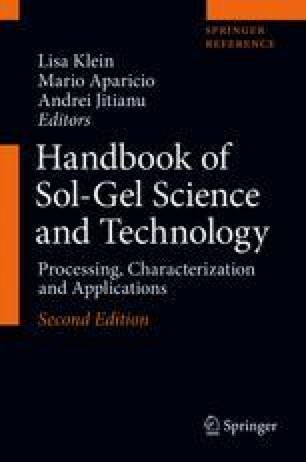 This chapter highlights a process related to the sol-gel route called “Pechini, or liquid-mix, process.” This process overcomes most of the difficulties and disadvantages that frequently occur in the alkoxide based sol-gel process. After a short historical introduction on the inventor, chemical mechanisms of the process, the advantages on the preparation of ceramic materials, and the drawbacks of the process will be shown. Finally, as examples of applications of the Pechini method, the results of investigation on ceramic superconductors and on Li-ion containing metal phosphates as cathode materials for Li-ion batteries are presented. The versatility, extensive applicability of the Pechini process with low production costs and potential material applications are demonstrated. I owe personally many thanks to Prof. W. Jaegermann (Head of the Surface Science Division, Earth and Material Sciences Department, Technische Universitaet Darmstadt) for giving me the possibility to contribute to this project and for the support during my work. Eror NG, Anderson HU. Polymeric precursor synthesis of ceramic materials. MRS Proc. 1986;73:571. https://doi.org/10.1557/PROC-73-571.